At Aardvark Automotive, our community is not simply a location for our shop it is the heart and soul of who we are and why we still exist today. Our goal is to consistently give back to a community that has given us so much in the past 33 years. Most of us stuck in the rat race take advantage of the little things. Between commuting to and from work, grinding through the workday, shuffling our kids around, making dinner, and perhaps going out to see a movie, we forget that some people come home to little at all. Some people don't even have a car to get them through their day. 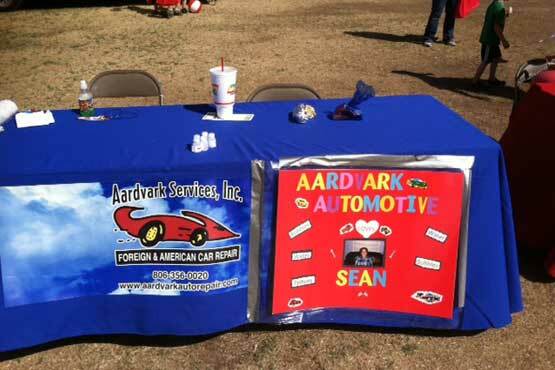 At Aardvark Automotive, our community service mission is to give a "hand up" to families in need through programs like Wheels to Prosper program. When it comes to poverty relief, everyday essentials like food, clothing, and housing must be met first, followed by transportation. In Amarillo, transportation is the next largest problem because of our limited bus system. Once a person can drive, he or she has access to work, school, and the world beyond, greatly increasing his or her potential. Please look through the various charities and events we participate in and consider donating an ounce of your time to better the life of your neighbor.